My favourite picture from the trip... a Rainbow Bee-eater at sunset in Point Samson, WA ... not sure how many times I have tried to get a shot with an insect in the bill. I even like the ant down on the wire waiting for a crumb! Just beautiful. This bird is on my bucket list....I see and hear them every now and then but they never stay long enough for me to go and grab the camera! Well done. 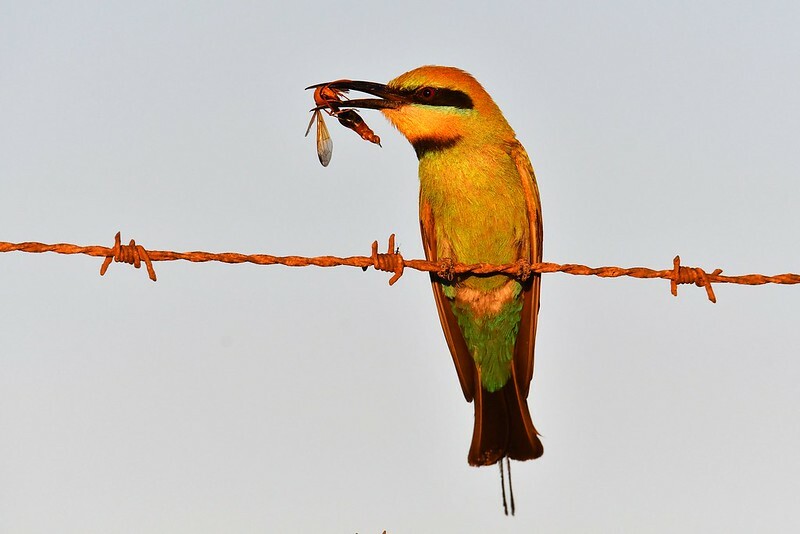 Gorgeous shot - love the light and all the matching colours in the bird insect and wire. I saw RB last month out Richmond way on the power lines - first sighting for a couple of years. Beautiful shot, Sue. I got an insect in the bill and I was only trying to get the bird. Good pick up on the ant, by the way. Wonderful capture, been looking for these guys around my local lake too. Yet to find one.